Twitter would really, really like to make ad-driven TV experiences central parts of its service, and it just confirmed that laser-like focus through an expanded deal with ESPN. The sports broadcaster will soon show in-tweet video highlights of football, soccer and the X Games; Twitter, in turn, gets a guaranteed volume of promoted tweetsto parallel ads inside the videos themselves. While we're not looking forward to the new marketing pitches when they surface in the year ahead, we'll be happy if we can catch more replays without losing our place in the social stream. 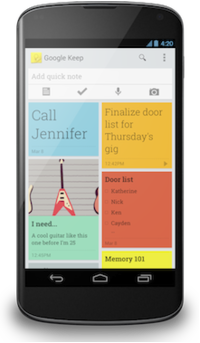 Google Keep has just been unveiled as the latest cloud-based app from the Internet giant designed to make life simpler. Basically, it's a digital dashboard for virtual sticky notes and reminders for basically whatever the user wants to save. It sounds simple, useful...and oddly reminiscent of another popular app that is gaining a lot of popularity -- and maybe too much for Google's liking. Consumers and now businesses alike have been flocking to the cloud and desktop notebook service in droves over the last year or two. It's grown from just a new app for saving articles and notes from the web to a growing platform for sharing, collaboration and file editing. It's arguable that slowly but surely there has been a battle brewing between Evernote (especially since the launch of Evernote Business) and Google Drive. Now with the addition of this note-saving feature for mobile devices (and soon desktops, more on that later), Google is actually the one playing catch-up. Nevertheless, it looks like a welcome and natural addition to the Google Apps platform. Google software engineer Katherine Kuan highlighted some of the key aspects in a blog post on Wednesday, including syncing across all devices so that notes are always at hand. Furthermore, Google is taking advantage of other technologies already on mobile devices, such as including support for voice notes. Google Keep is now available to download from Google Play for devices running Android 4.0 (a.k.a. Ice Cream Sandwich) and higher. Google will also be adding support for adding and editing new notes directly from Google Drive within the "coming weeks." Code.org, a non-profit organization with the goal to promote computer science in schools, has released a short film about computer programmers. The short film showcases famous computer engineers and encourages students to learn computer programming. Less than 2% of college students will graduate with a computer science degree. Yet, computer science related jobs are one of the fastest growing industries in the US. If you are interested find out more at: code.org. Here is the Rugby HQ special on the RefCam, a great new initiative to take fans closer to the game, by strapping an HD camera to the referee. This has shown some brilliant new and up close footage. SoundCloud has big ambitions — the company wants to leverage new partnerships with artists to become the leading destination for users to connect with musicians they're interested in. To that end, the company's releasing new iOS and Android apps today that add a few key features as well as a nice visual refresh (iOS only). The biggest new feature is the integration of sets, which are essentially SoundCloud's version of a playlist. Any song on the site can now be added to sets directly from the mobile app. Sets have been available on SoundCloud's site for some time now, but now they'll show up in the "stream" of updates from people you follow in the app, as well. You can start sets from scratch, add songs to existing sets, and share these via Facebook, Twitter, Tumblr, or old-fashioned email. The addition of sets is really a no-brainer feature given SoundCloud's focus, and one we're glad to see finally come to its apps. Somewhat surprisingly, SoundCloud has also de-emphasized the "record" feature in the app — on iOS, it is now buried in the "more" menu, while Android users can find it in the side menu. 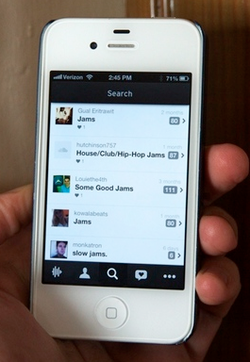 SoundCloud said it made the change to let users "discover and hear more within the app." It sounds like this change is just part of the efforts to get users playing and sharing music rather than using it to record sounds, a change of pace from the last major update this past September, which emphasized recording and editing audio. The update is available now in the App Store and on Google Play, but unfortunately the iPad version doesn't have access to the new sets features yet — SoundCloud says that'll happen "in the coming weeks."